SENATORS AND THE 17TH AMENDMENT « THE BRYCE IS RIGHT! Most Americans today are unaware U.S. Senators were not always elected by the people. According to the articles of the Constitution, senators were elected by state legislators, not the people or governor. This all changed with the ratification of the 17th Amendment in 1913, just over one hundred years ago. Why the change? Believe it or not, corruption in our electoral process. Sound familiar? Let’s begin by understanding the purpose of the Senate. Our bicameral Congress consists of two chambers, the House of Representatives is intended to represent the people. Their term limit is just two years. 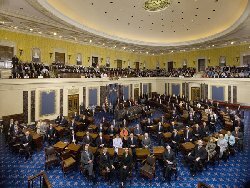 The Senate though was modeled after the Senate of Ancient Rome, whereby the elders and affluent citizens would take a more global view of the problems at hand. This is similar to Parliament in the United Kingdom where there is a House of Commons (for the people) and a House of Lords (representing affluence). Senators are elected to six year terms as opposed to two years. In addition to reviewing and approving the laws as passed by the House, the Senate also reviews and approves treaties, and confirms appointments of the cabinet, ambassadors, judges, and various other federal officials, all as part of the “checks and balances” of our government. They also conduct trials of impeached federal officials, such as the president, with the last being in 1999 with the impeachment of President Clinton. On paper, the concept of Senators being elected by state legislatures is a good one. As the legislatures changed in political makeup, from Democrat to Republican for example, the senators will inevitably change. In the early days there were a few senators who served multiple terms, but not like today’s senators who serve upwards to fifty years (e.g., Byrd and Kennedy). In other words, term limits were not necessary. Further, it was believed senators would be more inclined to serve the best interests of their states as they were elected by their own state assemblies. At least, that was the theory. Throughout most of the 19th century though, corruption crept into the senate electoral process. Some people tried to buy the office by giving gifts and favors to members of the state legislatures. This included some of the big monopolies of the day who wanted to have “their man” elected, who would be expected to return favors. The 17th Amendment though changed all of this by turning the vote over to the people. By doing so, state legislators were cut out of the money bonanza. It should be noted, the amendment was also used to fill senate vacancies, which is now done by temporary appointment of the governor. So, what has changed in the last 100 years? Whereas the state legislators were the target for bribery, now it can be argued it is just the senators who are the object of desire by lobbyists, not just at the state level either, but by national and multinational corporations. In other words, not much has really changed with the passing of the 17th Amendment other than a redirection of payola. Somehow, I still prefer the concept of having the state legislatures electing the Senators, if for no other reason than to assure they will change over time as the state assemblies change, thereby thwarting the concept of professional politicians. As to the corruption issue, this will remain a constant problem until such time as the American people get serious about electoral reform, which will probably be never. At least the payola can be spread around the state as opposed to just one person. NEXT UP: 40TH ANNIVERSARY OF NIXON’S RESIGNATION – Did Watergate teach us anything? LAST TIME: PERSONAL TECHNOLOGY’S EFFECT ON AIR TRAVEL – What I discovered on my flight from Asheville. This entry was posted on July 28, 2014 at 6:00 am	and is filed under Government, Politics. Tagged: Florida, palm harbor, SENATORS AND THE 17TH AMENDMENT, The Bryce is Right, tim bryce. You can follow any responses to this entry through the RSS 2.0 feed. You can leave a response, or trackback from your own site.